Anything Goes is one of Cole Porter’s most well known musicals and had been performed countless number of times since it was written. But while each amateur and professional production may be full of fantastic singing and stunning set design, Anything Goes is not one of the best shows in the musical theatre canon. Positioned like a Charlie Chaplin musical comedy with outdated jokes and some exciting songs, it’s becoming a show that is losing relevance and doesn’t stand up 81 years later. That aside, Dean Bryant’s new stage show adaptation makes the best of the lackluster show by throwing excellent performers, a fantastic orchestra, fun stage design and dedication to the original work, into a mixing pot of enjoyable musical theatre that pleases at every level. Set on the S.S. American, when the ocean liner sets sail from New York to London, the story revolves around Billy Crocker, a stockbroker, who is in love with the beautiful debutante Hope Harcourt, while famed performer Reno Sweeney is in love with him. There’s a bunch of other characters, all intended to provide sideshow humour to the show, and fluff up the story as the songs continue through two acts. The casting of the show is definitely its best asset. Caroline O’Connor is the star of the show and incredible as Sweeney, stealing every scene she is in and the main reason to enjoy the show. Alex Rathgeber, too, is very solid as Crocker, playing the character with perfect doses of naivety and passion. Strangely Todd McKenney, who is considered more top tire among these performers, isn’t memorable in his role as Lord Evelyn Oakleigh and doesn’t bring much to the role as expected. Indeed the entire play is a textbook tale of mistaken identities, private affairs, farce, slapstick humour and even include an appearance of racist Asian stereotypes. And while Bryant does his best with the script, there are shockingly bad segues between dialogue and music that renders Anything Goes a tired and obsolete addition to the best of musical theatre. Thankfully Bryant grabs every comedy moment with both hands and pitches it to the audience perfectly, which makes the comedy of the musicals. 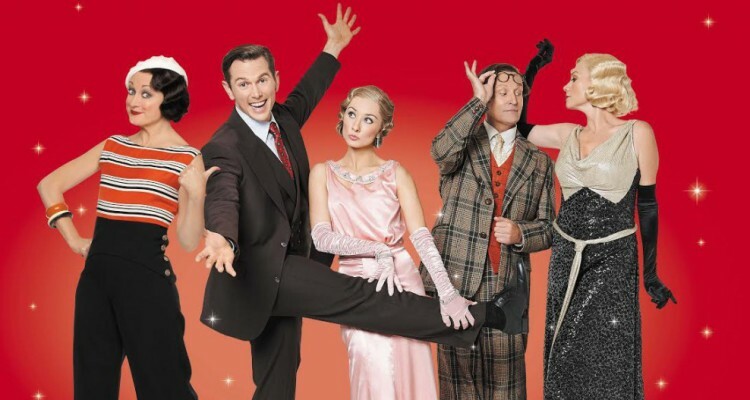 Choreographer Andrew Hallsworth is also excellent in making the musical fun and reminiscent of Marx Brothers comedy. Without the fun dance numbers, including the unforgettable ‘Anything Goes’ of which the musical is named, the show would be incredibly mediocre and extremely boring. Musical director Peter Casey also makes the music as electrifying as it was when Porter wrote the score over 70 years ago, with the music echoing through the Joan Sutherland theatre. Anything Goes isn’t the most original, fun or interesting musical out there, but it is true to the farcical nature of the time. And you can’t get any better than this production because this is one of the best adaptations of the shows to be on the Australian stage. So if the opportunity arises, go check it out.